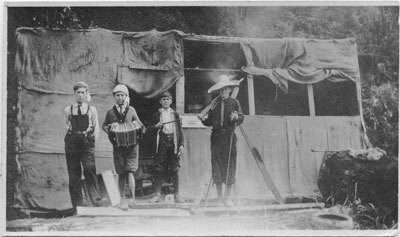 View of "The Pirates' Den" with four boys dressed as pirates posing in front. Clubhouse was located on the beach at the foot of 20th Street. Scanned August 2011 using Epson Perfection V700 Photo at 600dpi and 100% of original image size. Alternate Versions: Lossless TIF from original scan at 600dpi and 100% of original slide. W10 x H6 cm black & white print on photo paper. Negative Available.